The Cascade Blues Association’s 28th Annual Muddy Awards was held on Wednesday, November 2 at The Melody Ballroom to once again another full house of fans and musicians. Honoring those acts, performers, venues, events, recordings and performances who helped raise the bar on the Northwest’s blues scene over the past year in twenty-two categories. Dave Kahl – “Paul deLay” Lifetime Achievement Award. Three artists were big winners taking home two awards each: Andy Stokes for the “Curtis Salgado” Male Vocalist and the “Lloyd Jones” R&B Act; the Ben Rice Band taking both the Contemporary and Traditional Blues Act awards; and Dave Kahl for the Bass award and the biggest honor of the night, the “Paul deLay” Lifetime Achievement. Dave Kahl’s award noted not only his career as a bass player with a multitude of acts including the Paul deLay Band, Fiona Boyes & The Fortune Tellers, and the Ty Curtis Band, but also due to his tireless work to bring together the music community, seeking recognition from the City and means to make finding and connecting outlets for musicians through such efforts as MyGigNet.com. The Back What You Believe In Award was presented to CBA Vice President Wendy Schumer. This award notes those in a non-musician role that has made an impact. Wendy’s tireless efforts with the BluesNotes, various CBA events such as the Muddy Awards, a monthly blues emailing and daily posting of events in our area are just a few of the things that she has made her mark with. The top CDs of the year were awarded to Lisa Mann for the Northwest Album of the Year with Hard Times, Bad Decisions and the National Recording of the Year also stayed at home with Curtis Salgado taking the prize for The Beautiful Lowdown. 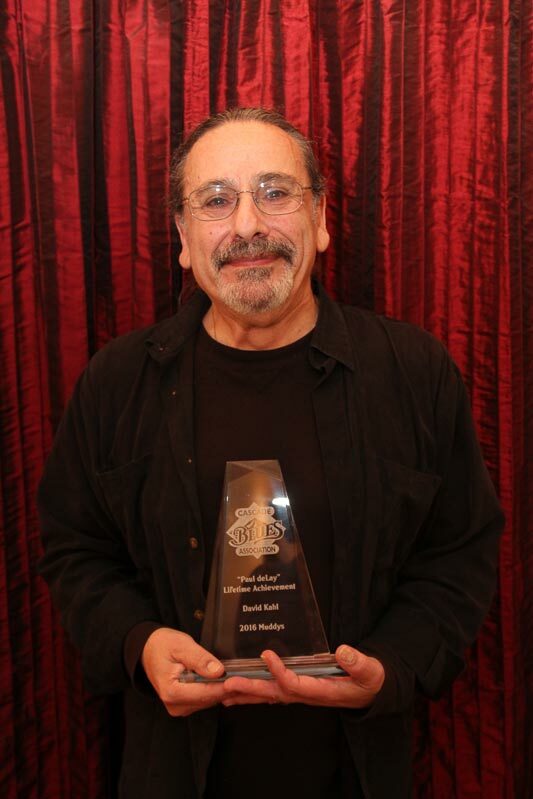 Mitch Kashmar was also recognized for the Harmonica Award for the third consecutive year, placing him into the Muddy Awards Hall of Fame. The Muddy Awards always has terrific music on hand and as tradition goes, we present sets from our Journey To Memphis winners. Band winners Rae Gordon & The Backseat Drivers opened the night and solo/duo winner David Pinsky played a mid-awards set bringing surprise guest Ben Rice for a dual acoustic guitar performance. Every year the night closes with a Muddy All Star Band made up of past and present Muddy Award nominees and recipients. This year’s band leader was Ken DeRouchie who was handed the reigns to put together a group for the night, and he came through big time. The All Stars included Arietta Ward, Ben Turner, Brian Harris, Chris Lay, Dave Fleschner, David Chachere, Doug Rowell, Edwin Coleman III, Jeff Knudson, Jimi Bott, Lisa Mann, Noah Bell, Pat McDougall, Pete Petersen, Peter Dammann, Peter Moss, Rae Gordon, Rob Busey, and Timmer Blakely. A big thanks goes out to The Melody Ballroom, Affordable Trophies, JBL Sound, Big Screen Productions, Cedar House Media, Photographer Tony Kutter, the CBA Board of Directors and all the volunteers who helped make this event happen, and to our membership, without whom none of this could occur. Please note that we are aware that there were problems with the online balloting that we began this year. It is a first effort and we knew that there would be glitches. Thanks to CBA webmaster Buko and Wendy Schumer for assisting those who needed an extra hand getting their votes entered. We will make improvements next year on the process. But when it was all said and done, we actually received more returns for the final ballot than we have averaged over the past five years.